Floating row covers protecting young crops. Floating row cover is a spun-bonded or woven plastic, polyester or polypropylene material that is placed over plants to exclude pests, act as a windbreak or extend the growing season by retaining heat — all while still being permeable to light, water and air. aster yellows (a disease transmitted by aster leafhopper) on carrot, celery, lettuce and many flowers. Floating row cover is easy to use in the home garden. 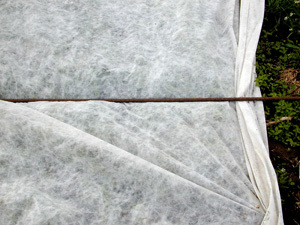 The row cover prevents the insects from getting to the plants, so it must be put on at planting. Adult fleabeetles and onion and seedcorn maggots, however, emerge from the soil so you must be careful not to enclose plants over an infested area. It is therefore important to practice crop rotation and not plant related crops or those crops susceptible to a particular pest such as seed corn maggot, in the same location in successive years. Also, you must remove row covers from insect-pollinated crops, such as cucumbers or squash, during bloom to allow for pollination — which obviously limits its use for pest exclusion on those crops. 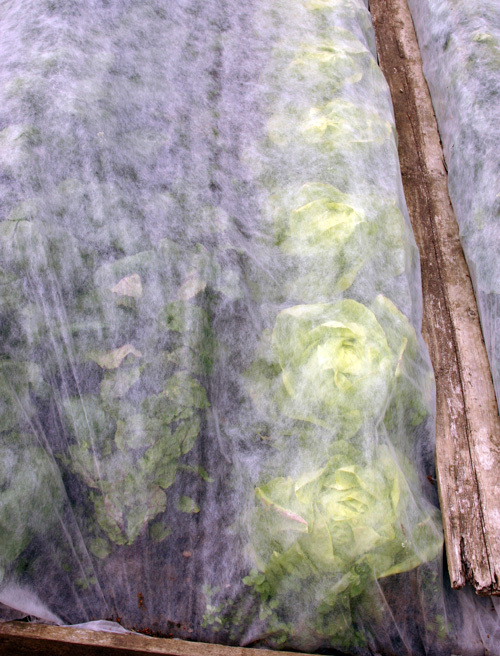 Depending on the weight of the covering you choose, you can gain between 2 and 8 degrees of frost protection, or warm the local environment sufficiently to harvest certain crops a week or two early. You’ll get the maximum benefit if the crop is planted on a south-facing slope. Floating row cover protects lettuce plants. There are several weights of these covers for different uses. 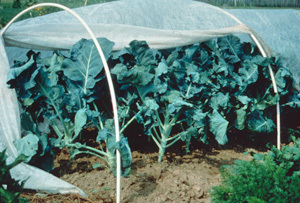 Lightweight covers tend to be the least expensive and are suitable for most crops. 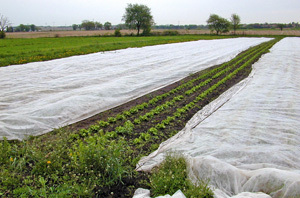 They will protect plants from desiccating wind, but there is only a minimal increase in temperature beneath the cover. Because of the light weight they don’t require supports. Different weights of floating row cover are made for different purposes. Mediumweight covers help speed up crop maturation and increase yield. They are useful for extending the season in both spring and fall by retaining some heat. These types are suitable for use over cucurbits, lettuce, peas, carrots, radishes, potatoes, sweet corn and blueberries. 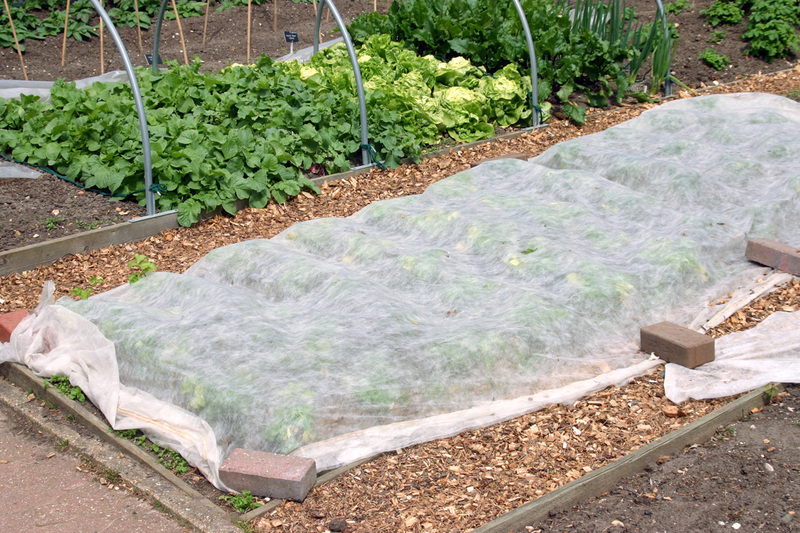 Heavyweight covers provide frost and freeze protection up to 4-8ºF, so are particularly good for early and late season extension for cool season crops. They can enhance crop growth, particularly for warm-season crops, since they raise ambient daytime temperatures 10ºF or more. But be aware that tomatoes and peppers may get blossom drop if the temperature beneath the cover exceeds 86ºF. Also, transmission of sunlight and water is reduced by these heavy covers. They are the most expensive, but can be reused. Rebar holding down a stretch of row cover. Floating row covers can be laid directly over low-growing, flexible crops. Just be sure to leave enough slack when covering rows so the cover can “expand” as the crop grows. You have to bury the edges completely if you’re using floating row cover for pest exclusion. If you are not using it to keep bugs out, you may use rough lumber or rebar to hold down the edges. Broccoli plants covered with floating row cover stretched over bent PVC pipes. It may be necessary to support the cover material on hoops for taller crops or sensitive plants, such as spinach, that can be abraded by the material if it sits directly on the leaves. PVC pipes are easy to bend and stick in the soil to create a framework over which to drape the row cover. 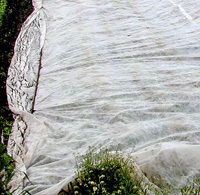 Remove covers gradually to harden off the crop. Choose a cloudy day to do the final removal. Store row covers out of direct sunlight, as UV rays will cause breakdown of the material. Row covers provide a mini-greenhouse for the plants that grow beneath — this include weeds. Periodically you will have to remove the row covers to eliminate weed seedlings that have germinated. Floating row covers generally aren’t used in flower gardens because of their utilitarian appearance, but you might want to consider using them over ornamental plants for limited uses, such as early in the season for starting seedlings outdoors, or for temporary protection of valuable plants. Floating row cover can be purchased at larger garden centers or from specialty mail order catalogs.